convert Clovis. Clovis invoked the God of Clotilde to help him at the battle of Tolbiac. After the Germans had invaded France in 496, Clovis, seeing he was going to be annihilated, cried out "O Jesus, you who Clotilde adores, give me victory and I will have myself baptized in your name." Hardly had he spoken, than the army of the Germans was vanquished. This answer to prayer brought Clovis before St. Remy to be baptized on December 25, 496. This day was symbolic of Christ's birth, Clovis being born again into a new life in Christ and a new people was born into the Christian faith because 3,000 of Clovis's men followed him into the faith. Clovis was baptized standing in a cistern receiving a triple sprinkling of water which symbolized faith in the Trinity. The bishop then poured the holy chrism over his head, anointing him with the sacrament of confirmation. With this spiritual awakening, Clovis continued to conquer the surrounding territory, bringing into effect the unification of his people. They called him a new Constantine because with him the kingdom of the Franks was built upon a Christian / Catholic foundation. Clovis re-established religious unity and political order; hence this alliance in the faith marked the beginning of a new European and Christian society. St. Remy Church, the nucleus of Russia since the first chapel was built in 1846 and the first church was dedicated in 1852, has had a long and interesting history. In order to trace this history, one must go back to the days before 1821 when there was an influx of European immigrants to the United States, often due to religious and political persecution, mandatory conscription, civil ware, and land ownership. In Ohio, the population grew rapidly, and the entire state was part of the diocese of Bardstown, Kentucky. The Catholic population was heavily concentrated in certain areas, one of which was in the area now known as Darke, Mercer, Shelby, Miami, Auglaize, and Allen counties. There were few priests to serve this area. Eventually, in 182 1, the Cincinnati diocese was created to serve the state of Ohio under Bishop Edward Fenwick until the appointment of Bishop John B. Purcell in 1833. With such a huge area to minister to, Bishop Purcell recruited priests in 1838 in Europe. He divided his diocese into five districts, the fifth serving the populous Catholic area in Ohio. The settlers of Darke, Shelby, and Miami counties chose a central site for the location of a small log chapel, built in 1839 under the guidance of Father Louis Navarron. St. Valbert's was dedicated on December 4, 1840. Due to distance, weather conditions, and wolves in the area, there was difficulty in attending church at St. Valbert's, which stood on the edge of a forest between the Russia and Versailles areas. The settlers in the Russia area built a log chapel on the farm of Jean Jacques DeBrosse in 1846. This chapel was a rude, log building with hand-hewn benches, plain windows, a few needed fixtures that were required to hold services there, and possibly an altar. It is believed that this chapel was considered a station or mission. 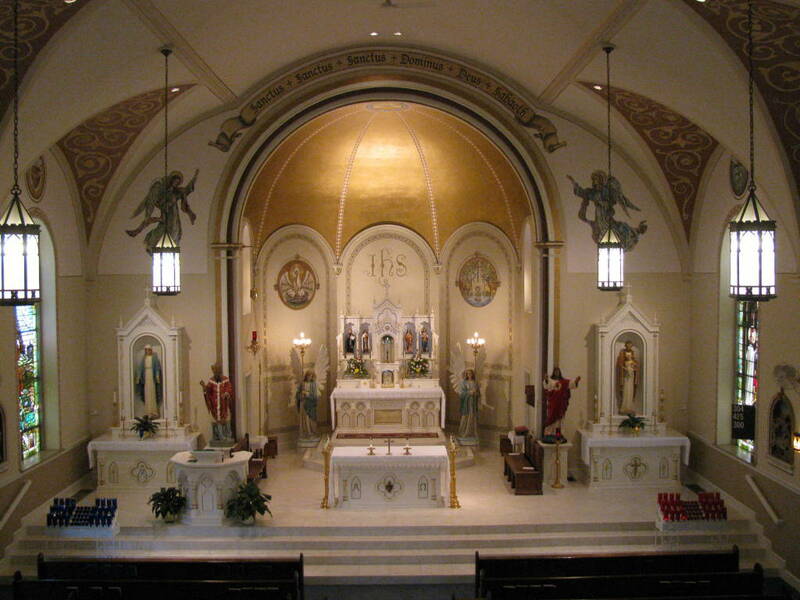 Then in 1850, the parish definitely was established when the diocese set up the boundary line to divide St. Valbert's parish into the two parishes of Holy Family and St. Remy. Legend has it, that there was a race to see which of the tow areas, Holy Family or St. Remy, could construct a church first. The winner was to receive a keg of whiskey. Frenchtown had a lo- church dedicated to the Holy Family on October 15, 1846, while Russia had their chapel on the DeBrosse fari-n also in 1846, but had no verification for a dedication date. In the meantime, the people in the Russia area constructed a real church on land acquired from Henry and Mary Jane DeLaet in 1850. The typical frontier church was a small rectangular building with gabled ends, a tall spire, a cross, and several Gothic windows on either side. It was probably made of logs since timber was plentiful. Trees, felled by the men and boys of the congregation, were cut into logs, notched at the ends, and carefully laid to form the foundation. Then a puncheon floor was laid. The side walls were made of logs laid upon one another; spaces between logs were filled with pieces whittled from the heart of the timber and tightly wedged with chinking or daubing plastered over the cracks. A roof made of poles laid from gable to gable then covered with clapboards covered the church. Stacked stones, chinked to form chimney and fireplace, windows of greased or waxed paper, and wooden doors secured by leather hasps completed the building. 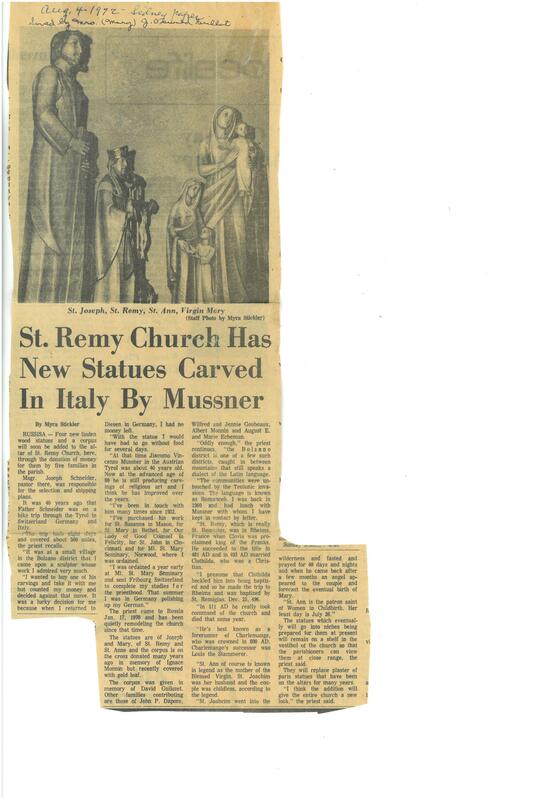 This first real church 'In the area was dedicated to St. Remy on August 17, 1852. It is unknown if the chapel built on the DeBrosse farm had also been called St. Remy's, but this may be likely since the DeBrosse family had come from the Doubs department of France in which St. Remy's is a village and scattered in the area were other settlers from Doubs, also. However, the second churches in each settlement, Holy Family 'In 1866 and Russia's 'In 1868, make it pretty clear that whether the bet was on the first buildings or the second, Frenchtown won the race! The parishioners of St. Remy finally had a church, but they were visited by a priest, Father Leon Meyer, only once or twice a month. They requested a priest to be sent from Nazareth, the central house of the Society of Mary in America, located in Dayton, Ohio, but this request was not granted. Then P. Joseph DeBrosse, in a letter written from St. Remy, Shelby County, Ohio, dated January 8, 1853, requested a teacher to educate the children of the parish, who could also serve as priest. The parishioners offered a tract of 80 acres of land near the church. Father August Joseph Rollinet came to serve the parishes in the area, located near St. Remy Mission. Because of the heavy workload, Father Roll'Inet sent for help. His brother, Charles and another priest joined him. 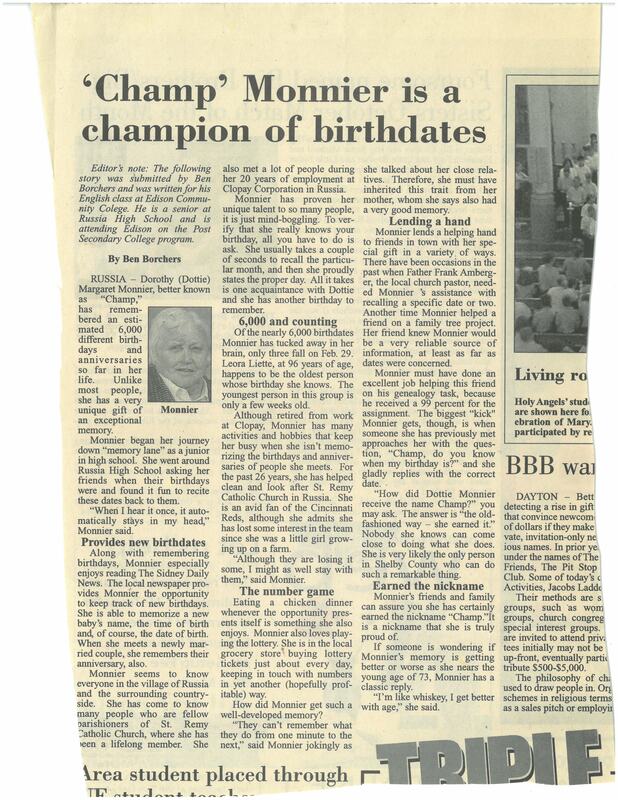 The first Communion and the first Confirmation of children of St. Remy parish was held June 15, 1854. On November 12 of that sai-ne year, the first bells, under the names of Marie, Remidas, Franciscus, and Constance, were blessed and the inauguration of the statue of the Holy Virgin was held. It must be remembered that St. Remy was a rural church in an open area, the church being established before the town of Russia was surveyed, named, and planted. With the coming of the railroads and the established church, a few scattered houses eventually, grew into the present town of Russia. Early settlers included Lewis Phillips, John N. Gasson, Rosa Ayette, Fierial DeBrosse, Joseph Cordonnier, and Clement Lachat. Several legends exist as to how Russia received its name. One legend says it was named Russia by early settlers from Alsace - Lorraine in France who had served in the Napoleonic Wars in the Ukraine. Another legend says the early settlers arrived in the dead of winter with several inches of snow on the ground and low temperatures, and that this, along with the rolling countryside, reminded them of the other Russia. A third legend says Russia got its name from the Russian wheat settlers used here which produced an excellent wheat crop. However the town was named, it became Russia somewhere between the years of 1859 and 1869. By 1868, the pioneer church was no longer able to hold the congregation. A new church was erected. Following a custom from the country of Russia, the new church was built around the old one. After the new church was completed, the old one was dismantled and carried piece by piece from the interior of the new one. This also assured that services were not interrupted during the progress of the construction. This church served the congregation until 1890 when a new church was built because the 1868 building was not constructed safely due to a lack of architectural advice. This structure is the one in use at present and is the third church built by this congregation. It is made of red brick in purely Roman style and faces Main Street, formerly known as the Russia Pike. Its original cost was not to exceed $8,500.00. The cornerstone for St. Remy Church was laid and blessed on July or August 17, 1890, by the Very Reverend Henry Drees, Provincial of the Congregation of the Most Precious Blood. On December 17, 1890, the church was completed except for plastering. It was probably dedicated in 1891. Originally, there were two entrances to the church, a women's entrance on the east side and a men's entrance on the west side. 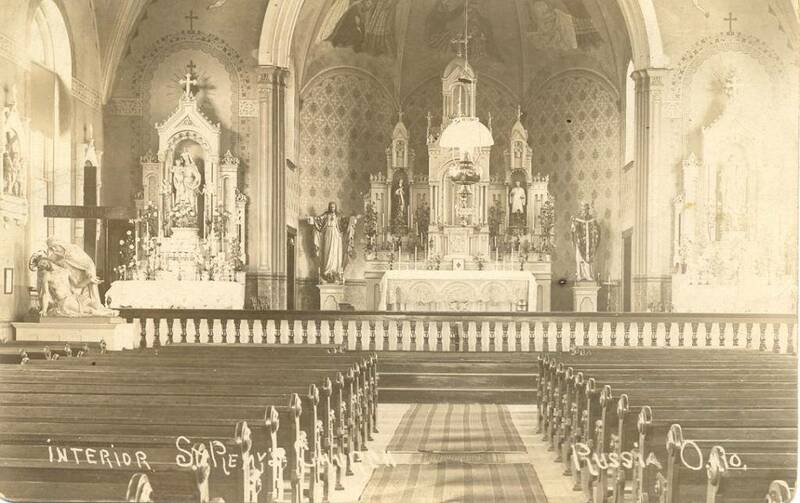 In 1904, the church was remodeled and artistically adorned with statuary and way of the cross. An organ was purchased. In 1909, the chalice was guilded. In 191 1, stained glass transoms were installed. In 1914, stained glass windows were installed. The west window in the sanctuary above the altar represents St. Paul. The east window represents St. Peter. On the west side of the auditorium of the church, the first window represents the baptism of Clovis, the first king of France, by St. Remy, Bishop of Rheims. Close by stands Queen Clotilda, Clovis's wife. The second window represents the "Patronage of St. Joseph," patron of the Catholic Church. The third window represents the Crucifixion of Christ. The last window represents the martyrdom of St. Stephen, the first Martyr to give up his life for the faith of Jesus Christ. The windows in the rear of the church represent adoring angles. On the east side of the church, the first window depicts the Stigmata of St. Francis Assisi. The second window represents the Annunciation. The third window depicts the Resurrection of Christ from the dead. The fourth window is Christ blessing the little children. In 1916, the church was frescoed. In 1923, a marble Holy Water Font was donated and was located in the Baptistry at the rear of the church. In 1927, a new in-the-wall, double confessional was installed. Indeed, over the last 100 years, hundreds of improvements have been made and many donations have helped to make St. Remy's the beautiful place it is today. Without its generous congregation, St. Remy's as we see it today would not exist. Even though our forefathers hewn the first log in 1846 and laid the cornerstone of our present church in 1890, St. Remy's has proven to be the cornerstone of our lives throughout the past 150 years. As the nucleus of our community, St. Remy has given us the inspiration to build our lives, the strength to face our trials and tribulations, and the faith to guide us in the future. We would like to thank Lois Ann Baker for her extensive research in compiling the complete history of St. Remy's Parish of which we have published only a small part thereof. Interior of St. Remy Church through the years. The first picture was prior to 1915, the year the electricity was installed. The oil light is pictured hanging from the ceiling in the center of the picture. 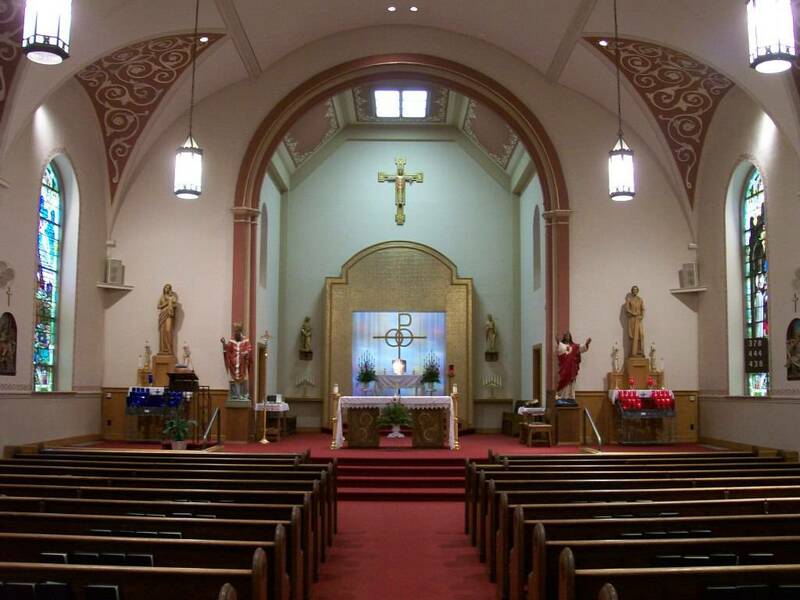 The second photo depicts the interior of St. Remy's from 1975-early 2010. The third picture was taken upon completion of the 2010 sanctuary remodel.